(1905-93) A well-known DDO astronomer (specializing in globular cluster variables) and popularizer of astronomy. She wrote an astronomy column in The Toronto Star for 30 years. Served as President (1957-58) and Honorary President (1977-81) of the Society. HELEN HOGG (1905-93) was born Helen Sawyer in Lowell, Massachusetts. After earning her Bachelor's degree in 1926, she proceeded towards her doctorate in Astronomy under Harlow Shapley at Harvard in 1931. There she met a young Canadian, Frank Hogg, who was also doing post-graduate studies in Astronomy and they were married in 1930. A year later they set out in their Model A Ford for Victoria where a position awaited Frank at the Dominion Astrophysical Observatory. Unfortunately, because of the depression, there was no opening at the DAO for Helen, but the Director, J.S. Plaskett, gave her the use of the 72-inch telescope to further the research she had begun at Harvard on variable stars in globular clusters. On some nights baby Sally, the first of her three children, slept in the dome while her mother took photographic plates. In 1935, the Hoggs came to the new David Dunlap Observatory. They rose steadily through the academic ranks, with Frank becoming the Director from 1946 until his untimely death in 1951, and Helen becoming a full Professor in 1957. Dr. Helen Hogg's international stature in her field grew as a result of her identification of hundreds of new variables and her many professional papers, notably the bibliographies of globular clusters. A complete list of the honours and awards she received would fill this page. Many of them reflect her generous efforts to ensure that The Stars Belong to Everyone (to use the title of her popular book). Every week from 1951 to 1981 she prepared an astronomy column for The Toronto Star and characteristically handled the steady flow of correspondence from the public with kindness and care. 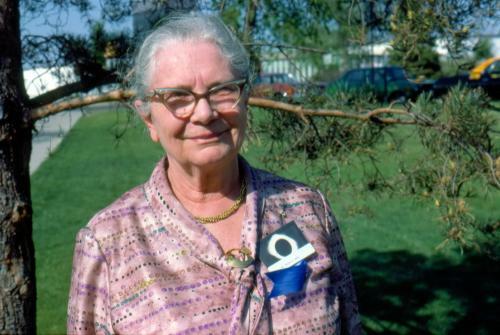 Within the Society itself, Dr. Hogg spoke to numerous meetings from Victoria in 1931 to Halifax in 1980 and her many historical contributions to the Journal were always lively and fascinating. In the 1940s and 50s she served on the Toronto Centre Council prior to becoming the national President in 1957. Her myriad contributions were recognized in the presentation to her of the Service Award in 1967 and her election to a term as Honorary President from 1977-81. The Society's deep respect for her scientific work was marked in 1987 when she became the only Canadian among 15 eminent Honorary Members. Displaying 1 - 4 of 22 items (page 1 of 6).